The boat cuts a silent swathe through the jade colored water of the narrow river. I imagine crocodiles lurking in the shallows. And surely those tangled boughs that dip into the murky surface shelter coiled serpents ready to strike. I spot several turtles basking in the morning sun on a submerged log. We cruise the narrow waterway under drooping boughs of willows, the muddy banks thick with a hedge of tall sedge. Black and emerald dragonflies dart over the water. The scene reminds me of a trip I once took in the bayous of Louisiana. But though there may well have been crocodiles here in by-gone times, and undoubtedly there are snakes among the reeds, this is a river in Greece. We are on a slow-moving motor launch sailing up the mysterious Acheron River, symbolized in Greek myth as the River Styx. There are no corpses aboard our boat, their eyes sealed shut with gold coins. Our ferryman is not Charon, but a jovial old salt, Captain Kostas, who has kept us entertained as he navigated the boat up the river from the port of Parga. We are on our way to visit the Oracle of the Dead, the Necromanteion, a mystical sanctuary that the ancient Greeks believed to be the entrance to the Underworld. Hades! Captain Kostas moors the boat by a reedy embankment from where we must walk two kilometers to the site. We trudge up the gravel road, through the cornfields to the small village of Messopotamo. 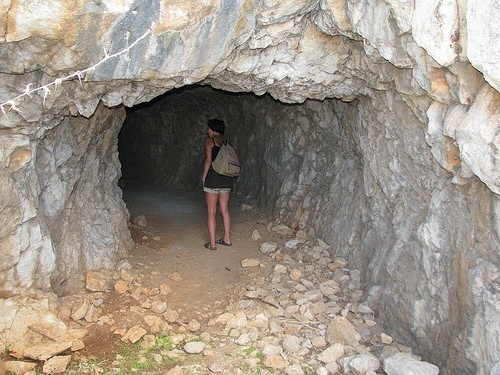 On a hillside behind the village, protected by cyclopeon walls and an inner circuit of polygonal masonry, dark passageways lead to the mouth of an underground cavern which was believed to be the entrance to the realm of Hades and Persephone. Ancients came here to consult the souls of the dead who, on leaving their bodies, acquired knowledge of the future. The Necromanetion belonged to the ancient Bronze Age city of Ephyra, the ruins of which are located nearby. The site had been inhabited since Mycenaean times judging from the finding of several shards and a bronze sword dating to the 13th century BC. The labyrinth and buildings, which include storerooms, priests’ lodgings, dormitories, baths and a courtyard, were discovered in 1958. It was the most famous sanctuary of its kind in antiquity. 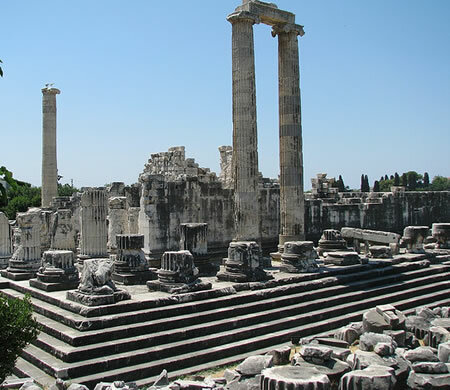 Many pilgrims visited there including Odysseus, who attempted to conjure Achilles’ ghost. The ancients believed that a persons’ soul was immortal after its freedom from the body, and that a mortal’s contact with the dead, with a view to predict the future, demanded special sacrifices and rituals. Offerings of milk, honey and the blood of sacrificed animals were made in the hope of conjuring the spirits of the departed. The pilgrims were subjected to three stages of physical and spiritual tests during which they were isolated in the dark rooms of the Oracle. Obliged to follow a special diet of beans and various hallucinogenic substances, they prepared to meet the souls of the dead. After several days of magical rituals, prayers, invocations and questioning by the priests, the supplicants were led down the dark smoke-filled corridor of the labyrinth to the entranceway of Hades, having faith that the apparitions of the dead would appear to them. An underground vault, thought to be the dark palace of Persephone and Hades, was the meeting place of the dead and the living. I descend into the cold, musty crypt by a narrow stairway. The chamber is carved in the rock with 15 stone arches supporting the roof. It dates to the end of the 4th century. It is here that the pilgrims were believed to have communed with the dead. As I stand in the gloom of the stone cavern I try to conjure a few ghosts of my own. It is an eerie place, and not impossible to imagine how the pilgrims, disoriented and under the influence of potions, could be fooled into believing the Dead were really there communicating with them. During Roman times, in 167 BC, the Oracle was proven to be a hoax when pulleys were discovered in the chamber, which apparently had been used to hoist up the priests who simulated the departed and answered the questions of the pilgrims. The walk through the hallucinogenic smoke of the labyrinth, the isolation and rituals they had performed during their stay, prepared them for accepting the appearance of the ‘dead’ person as ‘real’. After this discovery, the Necromanteion was destroyed and lay hidden until it was excavated in 1958 and restored by the Archaeological Society of Athens. After visiting Hades, I board the launch again to cruise downriver to the Acheron delta, then out to the open sea. A brisk wind had blown up and Captain Kostas navigates the boat through the choppy water sailing precariously close to the rocky shoreline. All along the coast great jagged rocks loom out of the sea like giant sea monster’s teeth. The limestone cliffs are riddled with caves. A variety of deciduous trees and tall spiky cedars cover the mountainsides that slope down to the sea. We sail past secluded coves with dazzling turquoise water and white sandy beaches. Captain Kostas anchors the launch at one of the pristine beaches, a long stretch of pebbles so smooth they glisten like polished gems. I rent a beach chair and spend the afternoon swimming and basking in the sun, luxuriating in Paradise until it is time to board again and head back to Parga. 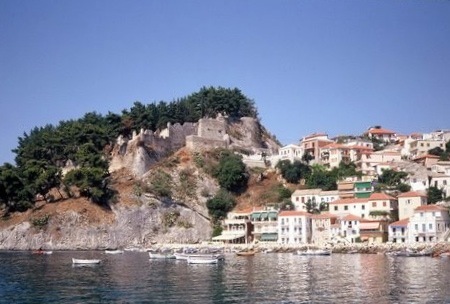 Parga is an ideal place for a seaside holiday, though in the months of July and August it’s crowded with tourists. Located on the north west coast of Greece, opposite Corfu, it’s a charming, picturesque town built around a sparkling cove, surrounded by thickly wooded hills. Parga was a British protectorate during the Turkish occupation of Greece and before that was occupied for 400 years by the Venetians. An impressive Venetian castle dominates the town, overlooking the bay. Its ramparts provide superb views of the coastline and nearby Valtos Beach. From Parga there are a variety of excursions, including the fabled oak oracle of Dodoni, and the Rock of Zalonga where one of the most poignant tragedies of the Turkish occupation took place when a group of Souli women and children threw themselves from the high cliffs to avoid capture by the infamous Ali Pasha’s men. You can also take boat excursions to the nearby islands of Paxi and Antipaxi. Most notable though, is the trip to Hades, a chance to experience a seance ancient style. An excellent day’s outing all for 7.50 Euros. W. Ruth Kozak is a historical-fiction novelist and travel journalist. 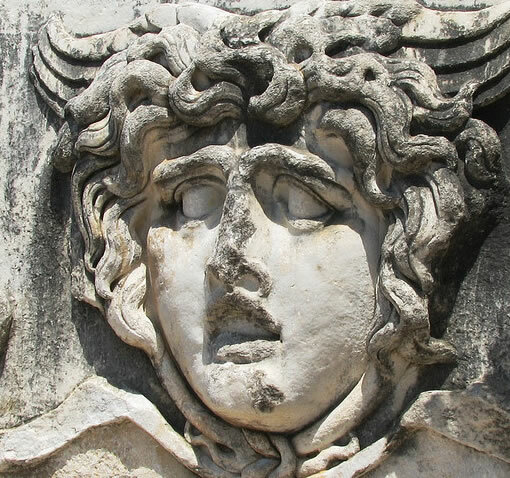 Her research journeys for her work-in-progress novel “Shadow of the Lion” (about the fall of Alexander the Great’s dynasty) have taken her to many sites in Greece including the Nekromanteion (Oracle of the Dead). Â Ruth has lived in Greece and visited there many times over the years and many of her travel stories are as a result of her research trips. Â Ruth is editor/publisher of an on-line travel ‘zine TRAVEL THRU HISTORY and writes a weekly blog, The Vancouver Guide, for Planet Eye Traveler.